Oven-Roasted tomatoes are pretty much my favorite (healthy) thing ever. Whenever I make them, it's hard to save them for the recipe, when really I just want to eat the entire pan as a snack. But it's definitely worth it to save them for this salad. White beans are one of my favorite types of beans, and they are the base of this salad. They are mixed with the sweet and tender oven-roasted tomatoes, pine nuts, lemon, and goat cheese. This is a wonderful side dish, but it makes a great lunch or light entree served over a bed of arugula as well. I have had a black bean salad with roasted tomatoes saved for quite some time, but for some reason I thought of turning it into a new salad using white beans, pine nuts, and goat cheese instead of the black beans, feta, and almonds. It just goes to show that it is incredibly versatile, and you can pretty much adapt it to any flavor profile you'd like. I've been making more of an effort to prepare interesting and healthy side dishes lately, and this one was a triple success: easy, healthy, and it made enough for me to enjoy for lunches for the rest of the week! If you want to add meat and turn it into a heartier main-course salad, then I think chicken sausage, grilled chicken, or shrimp would be great as well. Preheat the oven to 350 degrees, and position the rack in the top third of the oven. Halve each tomato and place them cut-side up on a rimmed baking sheet. In a medium bowl, whisk together the olive oil, sugar, and 1/2 teaspoon of salt. Pour over the tomatoes and top with cracked black pepper. Cook 45 to 60 minutes, or until the tomatoes shrink a little bit and start to caramelize around the edges. Allow to cool to room temperature before using. The tomatoes can be refrigerated in an airtight container (with their oil) for about 1 week. To make the salad, combine the beans, most of the tomatoes (with their oil), pine nuts, 1/4 teaspoon of salt, lemon zest, and lemon juice. Taste and adjust the seasonings. Gently fold in the goat cheese, and top the salad with the rest of the tomatoes and some fresh black pepper before serving. I've never seen anything like this, but I like it! White beans would definitely add a different texture. This looks delicious! 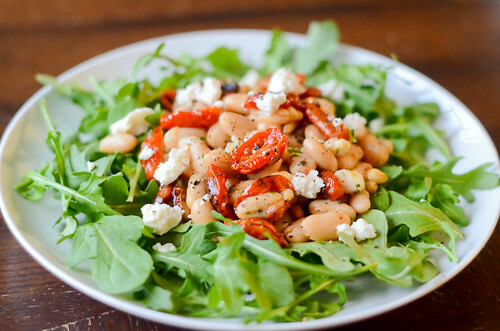 What a great combination of flavors - I love white beans and arugula (and, of course, goat cheese)! Love this idea, Josie. It sounds delicious! Oh my gosh! Yum!! What a great combination. I think I have everything to make this, too. This salad sounds like the perfect lunch. Roasted tomatoes so yummy! This is such a fresh and tasty sounding salad! Now this is my kind of salad! And oven roasted tomatoes totally taste like candy to me...which is a good thing, I guess? seems like everything i have been looking for in a salad is already here...the mixture is irresistible...can't wait to try! Joanne, that is definitely a good thing!! I love your recipes! I am a big fan on food gawker. Do you have a google +? I run a google + that distributes food articles and recipes. I would love to start sharing your stuff right from google +!! This recipe looks great. I love finding recipes that are healthy and yummy! wow! this is a healthy salad!